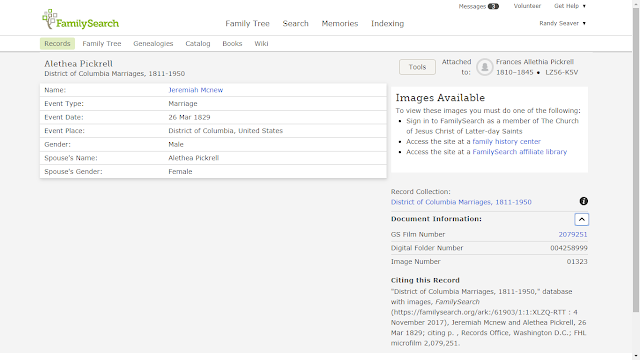 "District of Columbia Marriages, 1811-1950," database with images, FamilySearch (https://familysearch.org/ark:/61903/1:1:XLZQ-RTT : 4 November 2017), Jeremiah Mcnew and Alethea Pickrell, 26 Mar 1829; citing p. , Records Office, Washington D.C.; FHL microfilm 2,079,251. 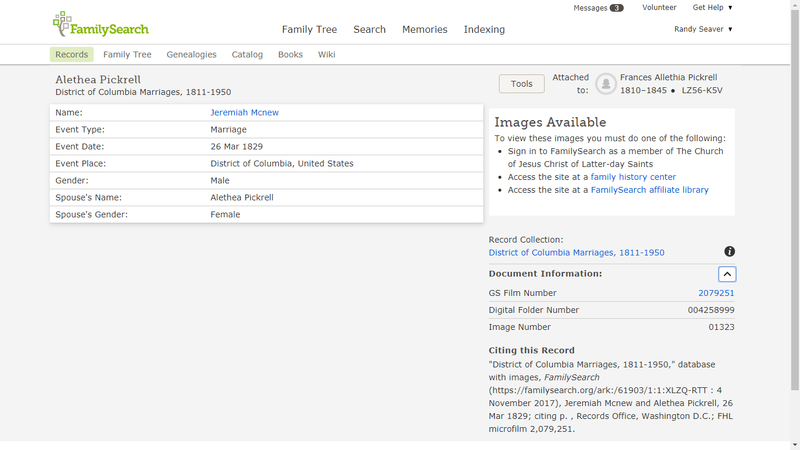 I cannot access the image because I don't have home access as an LDS church member, and have not tried to access it at the local FamilySearch Center. It's on my list of records to obtain! This is a Derivative Source because it is an index record obtained from the marriage register, which is probably an Original Source. It does provide Primary Information for the names, date and place of marriage, and is Direct Evidence of the event. I'm curious to see if the actual record will provide more information about the people and perhaps their parents' names. Jeremiah and Alethea (Pickrell) McKnew are my wife's second great-grandparents through their son Elijah Pickrell McKnew (1836-1912), who married Jane Whittle (1847-1921) in 1865.